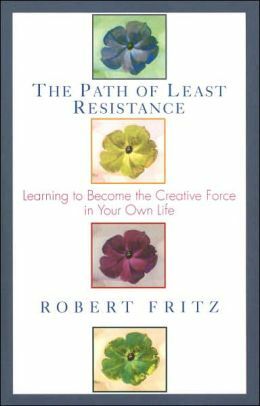 What actually motivates the creator is “the desire for the creation to exist” (58) says Robert Fritz in The Place of Least Resistance. Emotions will change, rising and falling, but this desire to create remains steady when you have grasped the end for which you wish to create. “A creator creates in order to bring the creation into being.” You create not for a return on investment, or to please everyone (or anyone) else, but rather because you see the need, or the end purpose, for its own sake. Poet Robert Frost, a highly creative person himself, wrote, “All the great things are done for their own sake” (quoted by Fritz, 58). Fritz suggests that parents who love their children can grasp this point more easily than the rest of us. Most parents love their child for who the child is, not as an extension of their own identity. The child has a life of his or her own. The child is a separate being. “The parent loves the child enough to bring the child into being and nurture the child until adulthood” (59). Healthy parents grasp this. It is the same with healthy creative leaders and practitioners. The creation is like your children. You bring them into being and nurture them so they can live. “You are not what you create. Even though your creations come from and through you, your creations are separate from you” (59, italics are mine). Think of our work as a form of co-creating as God’s image bearers, persons made by an eternal creator. We do not create anything without his will, permissive or otherwise. But create we do and in one sense we cannot help but desire to create unless this desire is dulled by other things in our lives. Fritz says, quite simply, “The reason you would create anything is because you love it enough to see it exist” (59). This sums up my passion for missional-ecumenism wonderfully well. I long to see unity among Christians and churches exist. I am often blunted in this desire by people’s blindness and stubbornness. Some do see it and, with me, act on it. As the creator of a dream for something much bigger than I can conceive I press on, regardless of initial response and failure. I learn all that I can about my dream; e.g. what it will take to nurture it, how to lead people into it, etc. I foster contexts in which I can share my dream. I watch for God-given responses that actually indicate something new is coming into existence. This “new” thing is the Spirit’s work yet the Spirit wants to use me as a creator and dreamer. In this creative process the most important and powerful question you ever ask is: “What do I want?” For me, as a Christian creator, I ask, “What do I believe God wants to use me to create?” This process, if followed, is very close to what Fritz is saying and yet it is suffused in prayer and spiritual conversation in my own context. I must be careful to never dwell on the “how” question before investing deeply in the “what” question or I will give up. I’ve learned this point from six-plus decades of experience. Let me illustrate my point from the field of education, which has many parallels with my vision since I am a Christian educator. In the education system “aptitude is often substituted for vision. For many people, their doing well on certain aptitude tests in secondary school was a great tragedy, because traditional guidance counseling helps students find out what they might be good at and [then] helps them design careers around their aptitude” (71). If ever a quotation describes my journey this one is it. My highest text scores were in science and math. My aptitude tests suggested this was my best career direction, not the ministry, education, writing or teaching. The truth is I am a very restless person who cannot sit still for long at all. I also need to be around people a lot yet I crave being alone. For years this tension baffled me until science began to offer some explanations. But no battery of psychological tests has finally helped me at all. I work with great “bursts of energy” (writing, reading, thinking, speaking, etc.) and I create stuff as an art form without thinking about it a lot of the time. If I had mindlessly followed the advice of my counselors then I would have chosen a boring and vision-killing life and vocation. But God kept me in my teen and college years and then led me in the way that he did. I, for whatever reason, listened. Soli Deo Gloria. “The great irony is that each one of these . . . uses conflict manipulation, promotes a vision that is, in most cases, the opposite of what they really want to see created on the planet. One tragedy of our times is that well-meaning people often lend enormous amounts of energy to visions they really do not want to see happen” (101). A major way that the modern church has tried to do this is through “the power of positive thinking” (105). We teach people to use “affirmations” that they can use on themselves. What is wrong with all of this? Fritz nails it and says, “In a word–truth” (109). The creative process assesses the current state of the creation in progress and does not impose a positive or negative view on reality. Creating is not based on will-power or self-affirmations. It is independent of these processes and embraces what Fritz calls “structural tension” (113). If you weaken the tensions you experience you will not be creative for it is out of such tensions that true creation comes. Think of this in terms of my vision for a uniting church. If I am “realistic” there is no way I can or should follow this vision. To be “practical” would force me to give up. But what matters, so very deeply to me, is unity in Christ’s mission. This vision pushes me to create new paradigms and contexts for this reality to take shape and to actually work. I have no precise idea how this will happen but I know deeply that what it is needs to happen. I do not see this all around me, but by faith I embrace it and move forward creating models and networks in the power of the Spirit. This is not psychology nor self-help. This is the reality of living by faith in a broken world where only God can bring such results about through those who trust him. I know what I want, and I believe God wants it, so I press on in my vision seeking to help others create new paradigms for unity in Christ’s mission. If I limit and censor my own vision I can kill creativity and faith. This is a great battle that I enter almost every single day. The organizing principle of my work, as Fritz puts it, is my vision. Vision is at the heart of all genuine creation. In this kind of vision there are basic principles, principles known by other creators, which help me to focus and empower others to embrace a new future. In the end I have learned these principles do work but God alone can give the end for which I labor. The vision comes from him and the creation, which is deeply rooted in me, is developed by him. This work of the Spirit is not discussed by Fritz but everything he writes clearly lines up with it. Some precious nuggets, like diamonds, that will reflect light upon our varied life places. One who creates wishes to create something with a life of its own. Definitely things to contemplate here. Jimmy McGuire liked this on Facebook. “If I limit and censor my own vision I can kill creativity and faith. This is a great battle I enter almost every single day.” Profoundly true in my life John. When I truly believe what the Spirit has breathed into my soul I am creatively faith-full…when in doubt, it is a kind of self imposed prison, hellish actually.